Charlie Wyke insists he is fit and raring to go after making his comeback in Sunderland's 1-0 win against Bradford City on Boxing Day. The 26-year-old, the Black Cats' most expensive summer signing, returned to first-team action for the first time since the 2-1 defeat at Burton Albion in September. Wyke, making only his second appearance in a red and white shirt, was stretchered off at the Pirelli Stadium after a nasty collision with goalkeeper Dimitar Evtimov. A three-month injury layoff followed which piled further injury misery on the ex-Bradford City man having also missed Sunderland's opening five League One fixtures. However, after taking to the Stadium of Light field since netting the equaliser in Jack Ross' side's 1-1 draw with Fleetwood, Wyke is delighted to be back. He said: "Yeah it's good to be back out with the boys - it's been a long and frustrating time but the boys were fantastic today and got the job done. "I've worked hard over the last few weeks, I've been training for four weeks now so I'm ready to go. "Last time I was chucked straight in and I wanted to be chucked straight in but I wasn't ready. This time, I'm ready and raring to go." 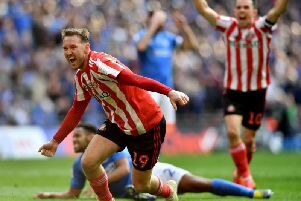 Wyke returned to witness Sunderland smash the League One attendance record, previously set by Leeds United in 2008, as 46,039 packed into the Stadium of Light. And it was Aiden McGeady's 31st-minute strike that sent the Black Cats-faithful home with a belated Christmas present, keeping them within four points of the top two with two games in-hand. "The fans were brilliant today and really got the boys going," revealed Wyke. "Obviously it's fantastic to play in front of that many people. "There's a lot of games in the next few weeks - so hopefully I can play my part and we can keep getting three points."